We’re on a roll with guest hosts and joining Kevin for this episode about Ferocious Planet is Jessa Phillips who’s the Editor-in-Chief of GoodToBeAGeek.com. You can listen to the episode now by using the ‘Play’ button below or follow the break for more detailed show notes. Syfy Saturday Monster Madness is down to the final 4. You can vote here. 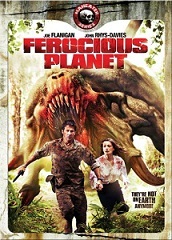 You can support our podcast by purchasing Ferocious Planet on DVD here. 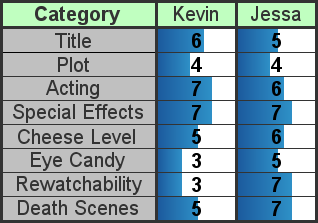 Feel free to post your ratings as a comment below or join in on the discussion on our forum. I wanted to see this because of Joe Flanagan and John Rhys-Davies. I was shocked that Rhys-Davies died so quickly, similar to the fate of Samuel L. Jackson in Deep Blue Sea. This movie reminded me of Savage Planet with Sean Patrick Flanery which had a similar plot, but not as well acted. The acting in this was much better than most SyFy fare. I enjoyed the jokes and Joe Flanagan’s acting, reminiscent of SGA. This movie had interesting enough acting, plot, eye-candy and was very entertaining for an hour and a half. A great twist ending also, which is unusual for these movies.